OK, I really feel in National Inquirer territory with this one. Thanks to the Ed Schultz Show forums for the info. Obama’s mother (Stanley Ann Dunham) and grandmother (Madelyn Dunham) are both still alive, their deaths having been faked. In fact, his mother registered a mortgage in Hawaii just a few weeks ago. “Mr. Obama is currently being fed over $250 million in overseas funds.” The money was laundered by means of stolen credit card numbers. I’ve been running across this “CIA saliva test” claim more and more in the last few days. Based on what you’re showing, it seems to be pulled directly from the Freeper’s rears. Clearly Obamaman is just another in a long line of New World Order stooges. Bottom line is, we are doomed – UNLESS! the aliens (and not the kind from south of the border, either)come and come quickly to save us from ourselves. Bob, would you like to write a guest editorial “Obamaman is just another in a long line of New World Order stooges”? Let me know. If you want to have a really good laugh, go over and play with the Cult of COLB crazies at the Berg Mothership blog for a bit! (at obamacrimes). They are a hoot! I have, of course, been banned– they don’t like facts over there (shockingly)! For the sake of the ones that haven’t heard my viewpoint here, I believe we will find the vault copy in order. But that doesn’t change the fact I feel it needs to be seen. I could’ve been sworn in to the military without raising my right hand, and did the same job, but I still raised my right hand, not my left(COLB), my Right. What Doc Orly is doing is wrong in my opinion. Many of Obama’s relatives are elderly. I sure would not want someone posting my great aunt’s phone number on a blog. There is no telling how many phone calls this poor woman has received. Invasion of privacy. And to go after deceased people is way off base in my opinion. I sure would not want someone getting a copy of my grandmother’s death certificate, medical records, employment records, etc., etc. Not that I have anything to hide but because they are private matters. His grandmother, to my knowledge, has done nothing wrong. 1) When you joined the military, 60 million people had not voted in support of your decsion to do so. 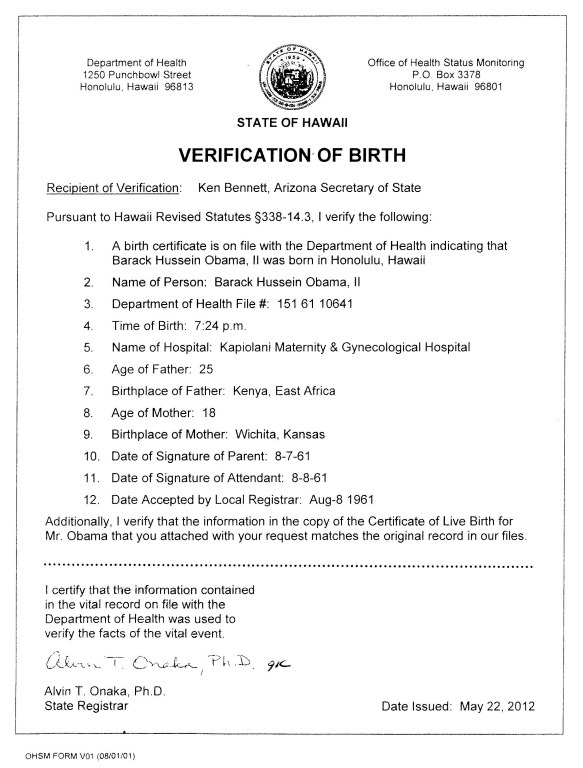 2) Many of those who DON’T need to see the vault copy simply recognize the REALITY that 1)Obama has posted an image of his BC online 2)Hawaiian officials have confirmed that Obama’s birth certificate is on file in Hawaii according to all laws, regulations, procedures 3) Factcheck has examined the ACTUAL document (some of us DO NOT believe factcheck is an “evil Obama controlled org) 4)Obama has a US passport, was a US Senator and clearly is NOT a reptillian, lizard person, Illuminati or whatever other bat-sh*t-craziness these loons are selling this week. Finally, LOOK at the SOURCES making these Obama is not a citizen claims. Are you really telling me you consider these folks 1)sane NEVERMIND 2)reliable. Sheesh. All they have done is speculate and weave conspiracy theory after conspiracy theory. They’ve offered NOT ONE shred of PROOF sufficient to even raise THE SLIGHTEST suspicion that Barack Obama was born anywhere other than Hawaii. The suspicion is clearly there. The burden is on Mr Obama to dispel it. Point (1) above is irrelevant in a Constitutional polity. 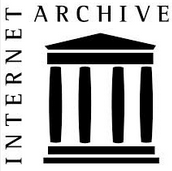 Point (2) typically confuses the image of an abstracted printout presumably based on an ‘original’ vault document, whose provenance and contents remain hidden from the citizenry. The ACTUAL document Factcheck claims to have handled is of course the abstract printout, not the vault document. The burden of proof clearly rests on Mr Obama to allay the suspicions his obstructionist conduct has raised among foe and friend alike. Until he releases the vault document and supporting hospital birth records, all the mindless rants and knee-jerk slurs will not dispel those suspicions. Got it? The paper certified copy (abstract though it may be) is evidence, which is more than the other side has. And it is more than just evidence, it is prima facie evidence, meaning the burden of proof is on the other foot. It is important to know what the controversy is and who it is disputing. “What” is how much publicity and how much money, how many books sold and how may web ads are clicked through. “Who” is you and me and a few hucksters/cranks/tricksters who keep stirring the pot as they sprinkle in disinformation and false hopes to their hapless victims. This is not about the government, Barack Obama, the Constitution, or anything in the real world. It’s nothing more than an Internet urban legend that has persisted longer than it ought. Obama didn’t even respond when the Supreme Court asked for comments on the Berg case (the only case before the SC that names Obama); he’s not even playing in the game. What the real world thinks can be found in my article: CNN Declares: Obama natural born. The burden of proof decidedly rests with the plaintiff bringing the legal suit. PERIOD. You may feel the burden SHOULD rest with Obama, because YOU feel he owes you and those making these claims whatever proof YOU finally deem acceptable. You may think he SHOULD have to satisfy YOUR requirements. However, that is NOT how our system of law or government works, despite what you think SHOULD be the case. The people making these claims are doing so without providing ANY EVIDENCE BEYOND THEIR OWN WILD SUSPICIONS. These claims have no basis and no validity until someone making them provides some ACTUAL evidence that might dispute Obama’s prima facie evidence (the COLB, which, in its document form is acceptable proof of birth in a court of law). If you can produce some evidence then someone might listenn to you. Until then, this is all simply rumor and conspiracy theory concocted by those who are unwilling to accept the results of this election. Before ‘standing’ is decided, the burden of proof by no means rests with the plaintiff. Quite the contrary.As courts have emphasized time and again (while at the same time ignoring their predicationin practice), judges are bound to assume the credibility of plaintiff evidence before reaching the merits stage. Also evidence, perhaps ofquestionable reliability,has been adduced challenging a Hawaii birth. Regrettably, Mr Obama has refused to release any confirmatory evidence in response, nor has he been compelled to do so in any vetting ordiscovery process. 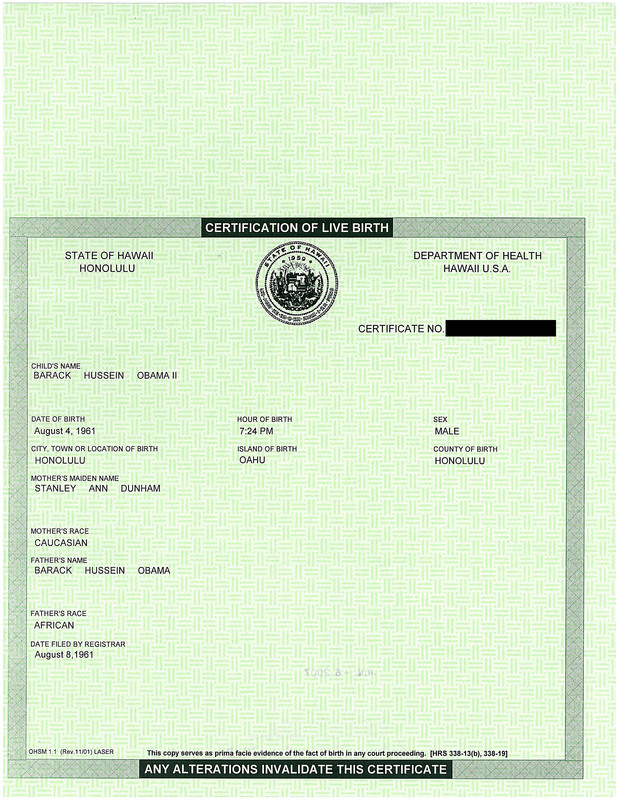 Are you sure PE Obama has notshown his birth certificate to those he was required to? It might just be the explanation as to why no one has paid any attention to this “conspiracy theory”. Make more sense that this being a “conspiracy” now doesn’t it. Just to clarify, a decision on standing precedes other decisions. When Berg sued in federal court, Judge Surrick dismissed the case on jurisdictional and standing grounds. In New Jersey state court, Donofrio’s request for an emergency injunction to stop the election was dismissed by the Judge for several reasons, among which was the Donofrio was unlikely to prevail should his case be judged on the merits. We have a birth certificate, confirmation of registration by Hawaiian officials (and followups by Health Department spokespersons) and two contemporary newspaper birth announcements. That’s more than I am aware of that any previous president has provided. So what’s the big deal? No, bog, I’m not sure. Are you willing to bet otherwise? I ask you to contemplate one reason you citedfor dismissingDonofrio’s injunction request: “Donofrio was unlikely to prevail should his case be judged on the merits.” Wouldn’t you call this prejudging? No Catch-22 here? I have no reason to believe otherwise. There has been no evidence provided that gives me cause to believe otherwise. Had there been any merit to any of these claims or evidence for that matter, Hillary and McCain would have been all over this. I say that Obama was NEVER adopted by Soetoro. PROVE that he was. Never mind the “evidence leads to the belief” crap, show some documentation or STFU. Extraordinary claims require extraordinary proofs. You are the one making the extraordinary claim, you are the one who must prove them, which you have not. 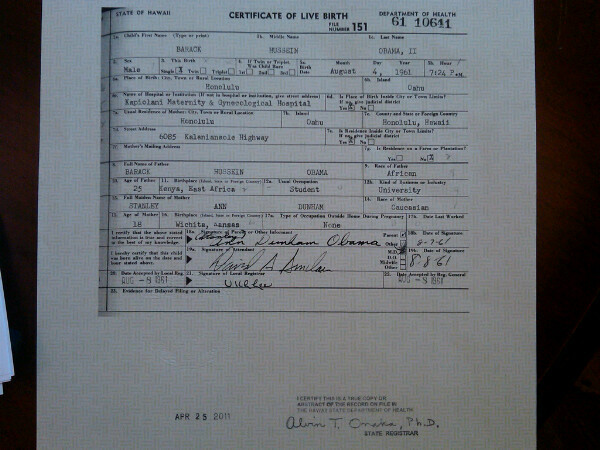 I was born in the same place as Obama, and my birth certificate looks just like his..not that I could reason you out of a position you obviously did not reason yourself into. Okay, Why are all of his records sealed from day 1 of his presidency? Why? Who the h– is Barry Soetoro? Is he an American or not? Our lives and our future depend on KNOWING who the h– is he? Millions of Americans want to know because he’s not acting like an American. MsBetz: Our lives and our future depend on KNOWING who the h– is he? Since you posed it as a question the answer is NO. Your life and future depend on YOU, not on knowing the intimate personal secrets of someone else’s life. Why don’t you mind your own beeswax and try to make something worthwhile of your life and future??? MsBetz: Okay, Why are all of his records sealed from day 1 of his presidency? Why? A fictional name given to the President by Birthers. Our lives and our future depend on KNOWING who the h– is he? Millions of our fellow Americans were satisfied enough with knowing who Barack Obama was to elect him the 44th President of the United States. Glad to have been of help. Happy Holidays! MsBetz: he’s not acting like an American. So, how do Americans act? Side note: foreign policy published an editorial from a social scientist that tracks the “brand value” of nations. His analysis shows that Obama has raised brand-America from 9th most respected to number one. The valuation of brand-America has risen from $9 trillion to more than $11 trillion during his term. Restoring America’s place as the shining beacon on the hill has real-world consequences that tranlate to more consumers of American goods and more dollars in the pocketd of Americans. The records are sealed by law not by his executive order, that’s a well known lie. So why are you not acting like an american MsBetz? Why do you let lies and misrepresentations guide you in your dislike of our first Black President? The big deal is that the Great Pretender has not proved constitutional eligibility. Until he does, he is not the president. Posing as a federal officer is a felony. If DNA analysis showed it was biologically impossible for GP to be Stanley Ann’s son, what you “have” is of no probative value. Great progress could be made with locks of hair from Obama and his claimed maternal half-sister, Maya Soetoro-Ng. These have the mitochondrial DNA that would establish whether Maya and GP have the same mother. All children of the same mother, even though by different fathers, have identical mitochondrial DNA. If they do not match, then on the assumption Maya is indeed Stanley Ann’s daughter, GP could not be Stanley Ann’s son, and any representation to the contrary would be false. GP will not co-operate under conditions to preclude fraud, because, I have very good reason to believe, the mitochondrial DNA of GP and Maya would not match. get back to us when your tests results come in, ok? I’m sorry, but did you miss November 2008’s election. I believe that the people voted and Barack was elected president. That means he is teh President of the United states. No amount of lying on your part will change that fact. He has proven beyond a doubt that he was born in Hawaii, and is a natural born citizen. ORLy faces the California Bar today. Hopefully, it will put an end to her shenanigans. All children of the same mother, even though by different fathers, have identical mitochondrial DNA. If they do not match, then on the assumption Maya is indeed Stanley Ann’s daughter, GP could not be Stanley Ann’s son, and any representation to the contrary would be false. If Barack and Maya’s DNA do not match, why would you assume that Maya “is indeed” the daughter of Stanley Ann? Wouldn’t it be just as reasonable to assume that Maya is not Stanley Ann’s daughter? I have it on good authority (Lucas Smith) that Stanley Ann was photographed in a bikini in the summer of 1970 and she does not appear to be pregnant. I think that we should get to the bottom of this by demanding that Maya produce her birth records from Indonesia. As I predicted- Birthers are now demanding DNA tests. Albert- did you ever require a DNA test to prove that George Bush or Bill Clinton’s parents were who they said they were? Funny how you never thought of that for them. So are future presidents going to be required to have DNA tests of not only themselves but their family members in order to prove that they are born of whom they said? And if for some reason the stated parent is not the actual parent then what? Even though- it doesn’t matter as long as the person was born in the United States. Really Albert think this through. Do you really want to require every future Presidential candidate to be required to submit DNA samples- and his parents and siblings. And what of candidates with no living family? Are they banned from running from office? Just silliness. Complete and total silliness. And of course even if a candidate agreed to submit a DNA sample, what if the candidate’s relatives refuse? Would that disqualify the candidate? 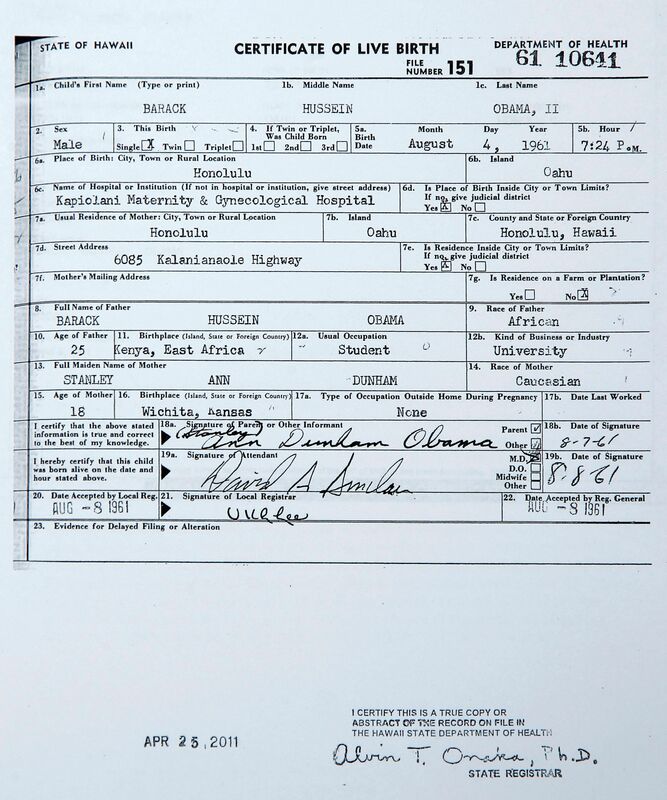 I fully expect that some birther is going to argue that Obama had his mother’s body cremated so it wouldn’t be possible to exhume her and obtain her DNA.